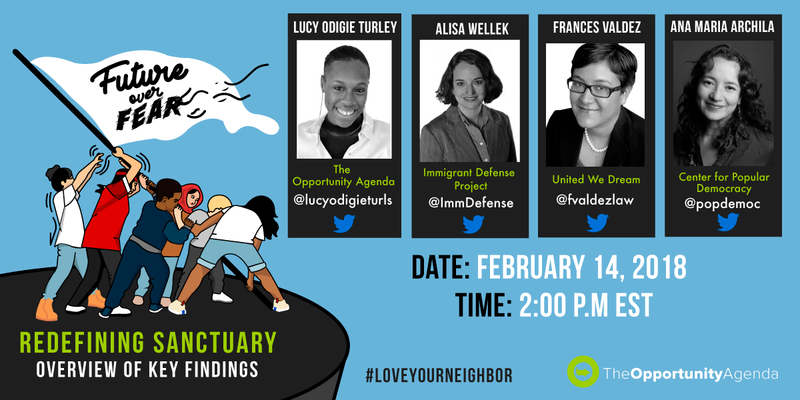 On Feb. 14 at 2 p.m. EST, as we began our Future Over Fear webinar series with a discussion about the current state of immigration policy, and the troubling threats posed against sanctuary jurisdictions and undocumented immigrants across the country. We shared findings from our latest research, Redefining Sanctuary, a three-part analysis of existing public opinion research, media coverage, and social media discourse concerning sanctuary jurisdictions, DACA, and related immigration policies – and provide practical recommendations for talking about these issues with persuadable audiences. Guest speakers Ana Maria Archila, Co-Executive Director of the Center for Popular Democracy, Alisa Wellek, the Executive Director of Immigrant Defense Project, and immigration attorney Frances Valdez talked about their own work and share strategies for advancing narratives and policies that ensure the continued protection of immigrant communities.